Obituary of Alfred John Rudt | Perry-Komdat Funeral Chapel - Perry-Komdat Funeral Chapel, Inc.
Ticonderoga- Alfred John Rudt, 96, of Interlakes Health Elderwood Nursing Home died on Friday, April 13, 2018 after a long illness. John Rudt, known as a child as Freddy, was born May 31, 1921 on the family farm in Hoag’s Corners, NY. He grew up in Perth Amboy, NJ helping his parents Alfred and Bertha (Hoffmann) operate their diner, earning his Eagle Scout badge and teaching his pet parakeet to sing while he played ukulele. After finishing high school he joined the US Navy serving at the Newport Torpedo Station and then after Pearl Harbor was transferred to Australia for the remainder of WWII. He retired from the Navy as a Chief Petty Officer. During his time in the South Pacific, he met and married Elisabeth “Betty” Leonard in Brisbane, Australia. After an eighteen-month separation at the end of the war they settled in Averill Park, NY raising a son Robert and a daughter Kathryn. John and Betty both volunteered in the local community. John was a volunteer fireman and also a Boy Scout Leader for many years. John was employed at the Watervliet Arsenal as a Millwright for 35 years and then another 10 years with the Averill Park School System enabling him to provide college educations for both his children. After retirement he moved to Clifton Park. Summer vacations with the family were spent at Roger’s Rock Campground on Lake George starting in 1952. In the 1960’s John and Betty bought a camp in Gull Bay on Lake George. Many hours were spent by the campfire with friends listening to John play harmonica. He was an ardent bird watcher and spent many hours feeding and watching birds in his backyard. John and Betty also enjoyed trips to Myrtle Beach, Oklahoma, Grand Canyon, and Yellowstone. John also loved photography and left behind a treasure trove of family vacation and holiday photos. He was an accomplished sailor as well and many folks in Gull Bay will remember seeing him sailing in his sunfish – while reclining! 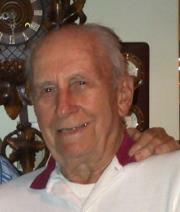 He is predeceased in 2012 by his wife of 68 years, Betty Rudt. They are now dancing together as they used to do in the ‘good ole days’ where folks would often clear the floor to watch them dance. Survivors include his son Robert (Cecilia) of Putnam Station, N.Y., daughter Kathryn (Richard Kirker) of Cameron, N.C., four grandchildren and two great grandchildren. The family wishes to express their sincere thanks to the InterLakes Health (Heritage Commons) staff (now Elderwood) for the care and consideration extended to John during his last two years with us. Thank you!